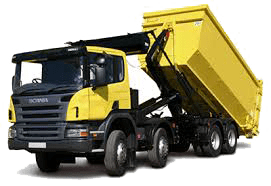 A demountable container system is a system built onto a road vehicle and is designed to pick up a container from the rear of the vehicle at ground level, to place it on the vehicle’s carrying chassis to transport it over distance and to deliver it to a location. It may also be designed to discharge the contents of the container by tipping as necessary. The system is powered by hydraulics generated by pump either from the vehicle’s engine through a power take off or by its own dedicated power supply. The demountable container is designed to be pulled and lifted by a hook onto the rear of the vehicle. It may be operated from a position at ground level alongside the vehicle, but usually from inside the cab of the vehicle. Hook lift demountable containers may be used for bulk refuse, builders’ waste, recovery of broken down vehicles, bulk logistical supplies, conventional shipping containers, fire and rescue services, military logistics supply, etc. This BRITTOp accredited course is designed to train the operator in operating the equipment only. It is not designed to train the operator to drive or manoeuvre the vehicle, nor is it in any way designed to meet the standards of the LGV Driving Test. Introduction; explanation (safety information); outline of training course; training course timetable; certification.